Rookie Scrivener: The Great "Great Lenore" Book Giveaway! The Great "Great Lenore" Book Giveaway! I've been tweeting about this for more than a week now, but I think it merits a blog post as well. 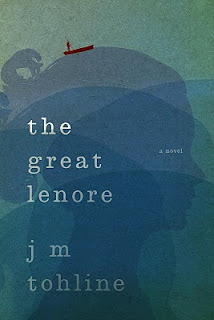 As you will recall, I posted a review of JM Tohline's debut novel, The Great Lenore back on April 3, 2011. You don't recall? Well, go there now! You should also check out Jordan's site and the Great Lenore page, while you're at it. Suffice it to say, that I loved it. So much so, that I'm giving away two (that's TWO) free copies (yes FREE) to anyone that spreads the word on Tweeter. Step 2: Paste it in your Tweeter message field and press "Tweet." Now all your followers know about the contests and the book. I will add the names of all those that have already tweeted and all those that will tweet through 5 PM PST June 12th to Randomizer.org and find my two (did I mention TWO?) winners. Can it be any easier? Me thinks not! Here's my motivation. There are a lot of great books out there that may not get the marketing budget for whatever reason. If I love something, I will spread the word. As a writer, I'd like to believe that it's also my task to help propagate great stories. Thus, I'm propagating! So help a debut author make an impact in the writing world. You will be able to say, with no doubt, that you helped make a difference. Always, fight the good fight!